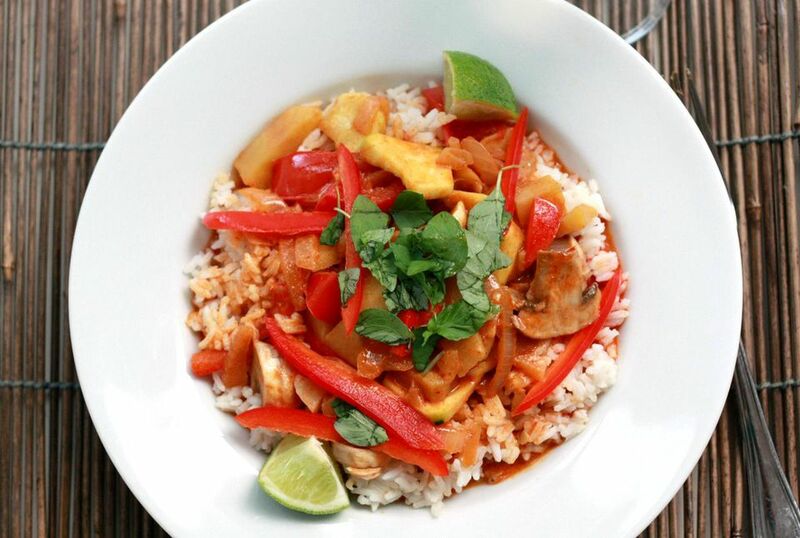 This Vegetarian Thai red curry recipe is easy to follow and combines shallots, lemongrass, red chillies, galangal, cumin, coriander seeds, kaffir lime leaves, wheat gluten or tofu, yams or sweetpotatoes, Japanese or Chinese eggplant, shiitake mushrooms, and Thai holy basil to create a real vegetarian thai dish that will tantalize the taste buds. To make the paste, place all paste ingredients in a food processor. Add ½ can of the coconut milk and process into a paste. Place paste, wheat gluten or tofu, remaining 1/2 can coconut milk, and limes leaves in a casserole dish. Stir well until paste is thoroughly mixed with the other ingredients. After another 10 minutes, remove from oven. Check to make sure vegetables are cooked to your liking. Do a taste test for salt and spice. If not salty enough, add up to 2 Tbsp. more soy sauce (or season with sea salt). If not spicy enough, add another red chilli, sliced finely, OR 1-2 tsp. Thai chilli sauce. If too salty, add up to 2 Tbsp. lime juice. If too spicy, add a little more coconut milk (yogurt will work too if you are non-vegan) and stir well. Sprinkle with fresh basil leaves (these can be roughly chopped if too large), and serve with plenty of Thai fragrant rice (white or brown) for a nutritionally complete and satisfying meal.